I’m doing my best to stay caught up on the new FQS Designer Mystery BOM. I could have sworn I took pictures of my cuttings for Block 3 before assembly – but I can’t find them anywhere. I believe I mentioned in an earlier post however, that I had no problem getting my two blocks cut out from the one package. I was excited about the block pattern too – it was another basket block. I think this may be my favorite basket block so far that I have made. 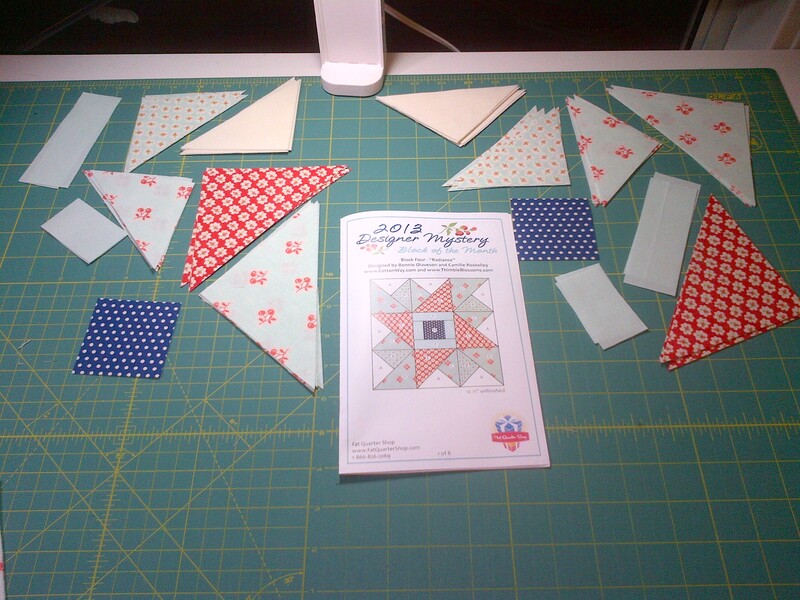 Although I have the Sweet Caroline pattern from Fig Tree that I am anxious to start. 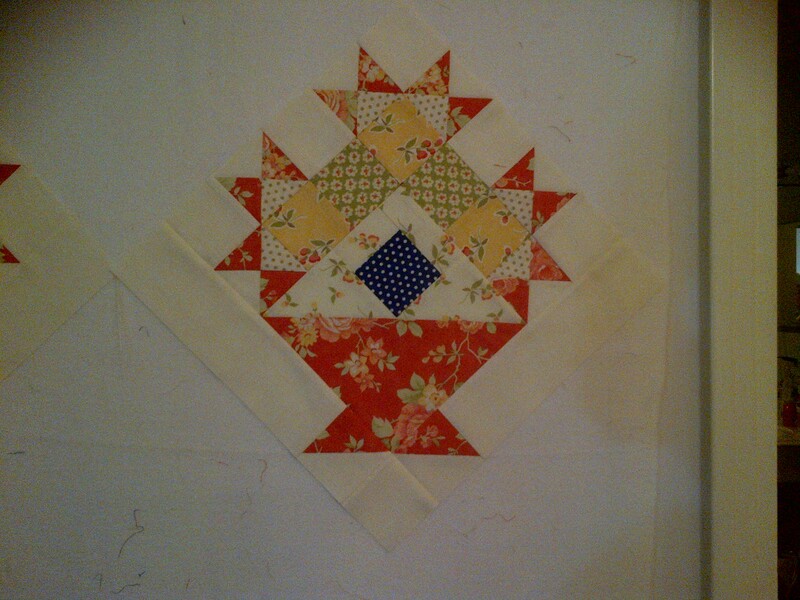 Those points will be cut off when I join this block to others in the quilt. Not just the points in the picture above, but ALL the flower points will be cut off somewhat. I’m not happy about it. And I was really impatient and stupid to trim the blocks down .. KNOWING that it was going to do this. I just thought I could live with it. I probably won’t. 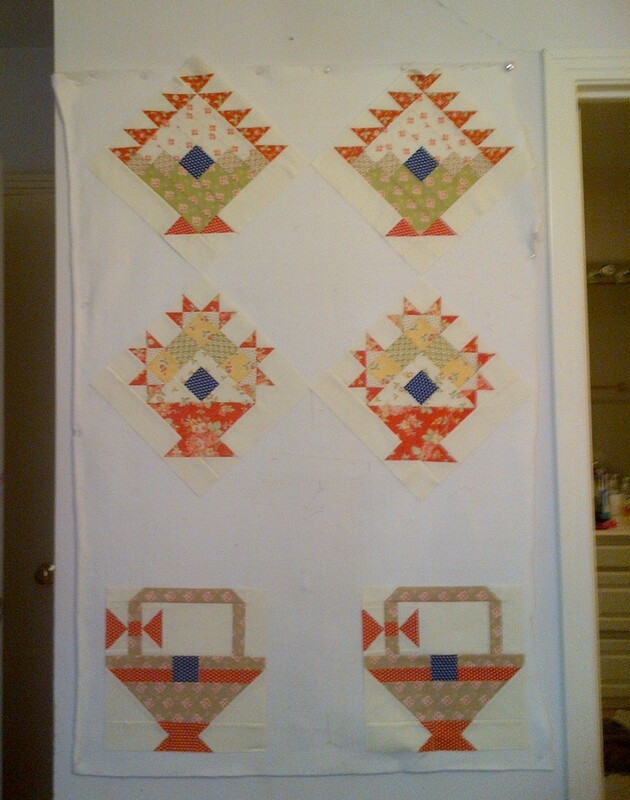 I will probably pick these two blocks apart back down to the base basket and repiece the outer patchwork that I prematurely trimmed from scrap and do it again. Next month maybe. Block 4 of this series arrived around the 10th of the month and I have it cut out and ready to piece tonight. No problem with the fabric allowance. 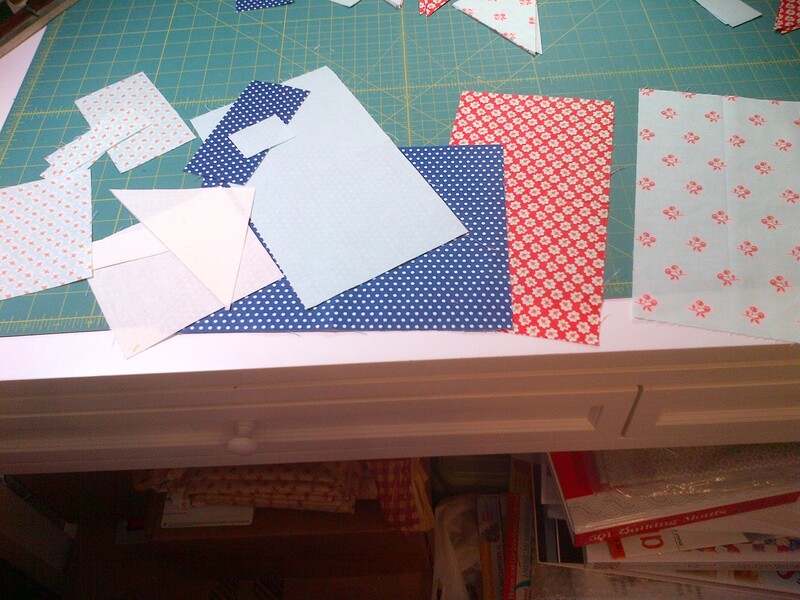 However, the cutting calls for 5 1/4″ squares in many of the fabrics and then they are all cut twice on the diagonal. Well, … I couldn’t quite get the full 5 1/4″ square on the second set – it would have been off about 1/8″ one one side … so I just adjusted it to cutting out two 3 3/4″ squares and slicing them only once diagonally and I got the same result! This block has a lot fewer pieces and a lot fewer steps to put it together than last month. Does that bother me? Heck no!! Nothing wrong with an easy month! Still lots to put in my scrap basket! Thanks FQS! Finally – here are my first three block sets together on my design wall. Block 4 will be up there soon enough! Thanks for visiting today – see you again soon with Block 4 and then I hope to move on to a little work on my Robin’s Nest quilt next. I have a slew of BOMs starting in a month or two from FQS and I need to be ready!! I’m bummed I didn’t do this year’s FQS BOM, now that I am seeing your blocks. They look great! You’ll get a chance to see them up close and personal – I hope! Around this time next year it will need to be quilted. 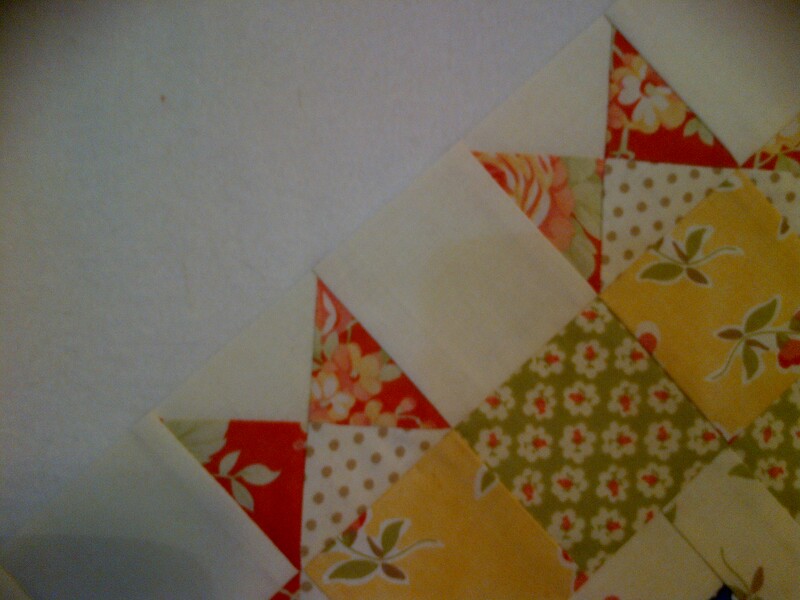 Love the custom work you did on the last DM BOM quilt… looking forward already to getting this one done custom as well! I am loving your BOM! Those blocks are so cute. I almost regret not signing up for this one! It is going to be beautiful… and yours will be double-ly so!